To help all rankers of AIPGMEE plan their choices in the counselling of AIPGMEE, we have gatered and compiled the cut off ranks, subject wise for all rounds of the last 3 years that is 2016, 2015 and 2014 counselling of AIPGMEE. 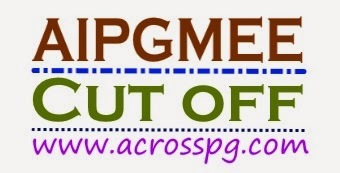 PS: The details of Round 1 and Round 2 of AIPG 2016 counselling will be updated in 24 hrs. Keep watching this thread. For any query reply to this post.